Sometimes it may not be convenient for an entire office to switch to height adjustable desking as an installation sometimes can take a bit of organizing and be timely. Some CEO'S or managers may want to introduce the concept of sit-stand desks steadily, to see if the desks will be utilized in the correct way or if the employees are feeling the benefits. Some individuals may also not have space for a completely new desk, so a desktop sit-stand workstation which converts a normal desk to a sit-stand desk could be a logical alternative on these occasions. 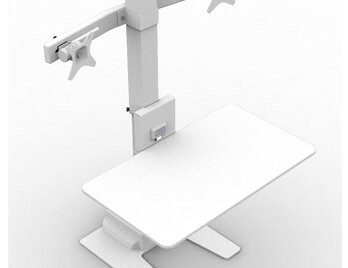 A desktop sit-stand workstation can be available in two styles one which supports the keyboard and monitor and lifts up on a gas spring. The other style features a platform base, vertical telescopic support and monitor arm supports which can be incorporate push button controls in order to lift up or down. 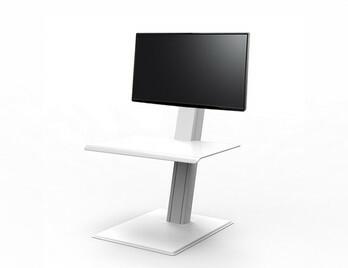 Humanscale's QuickStand Eco is the next generation in portable sit/stand products. Sleeker, easier to use and more sustainable than ever before, it is a vast improvement over the current generation of sit/stand options. Available in laptop, single or dual monitor configurations. QuickStand is easy to set up, portable and has near effortless adjustability - transforming ordinary desktops into healthy, active workspaces. Voted the best office accessory of the decade at Interior Design magazine's 2015 Best of Year Awards, the QuickStand height-adjustable workstation raises the bar for ease of use and stability among sit/stand products. QuickStand seamlessly transforms any fixed-height desk into an active one, promoting collaboration and well-being in the workplace. QuickStand Under Desk allows users to seamlessly alternate between sitting and standing postures without interrupting workflow. The continuous force mechanism is enclosed within a central column beneath the desk surface, so views are unobstructed in the sit position. Offering effortless functionality and a sleek, modern design, QuickStand Underdesk is an understated workspace wellness solution that blends into any environment. Sitting for over 4 hours a day may lead to disrupted blood sugar levels, increased blood pressure, and back pain. If you could reduce your sitting time, even by an hour to 3 hours, you can increase your life expectancy. 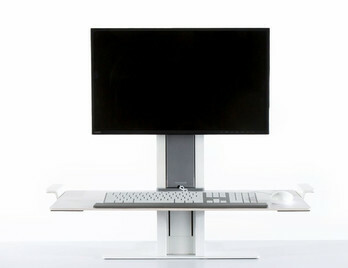 The Boost Sit-stand workstation is a new ergonomic development designed for busy professionals. It's so easy to use, from sit to stand with a simple pull. It keeps you pro-active, energetic, and efficient in your workspace. 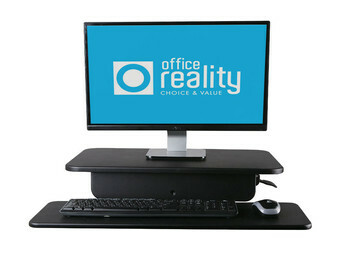 Active Electric Sit-Stand Workstation converts and desk or work surface into a sit-stand workstation. At the gentle touch of a button, the user can go from sitting to standing. The height adjustment feature is power assisted, smoothly taking your keyboard and monitor through a height range of 45cm. The workstation comes with single and double monitor supports. This workstation can healthily transform your working environment overnight, as it's kept in stock on a next day delivery.